Manuscript update: Current word count is 14,577. I am managing to wake up early and write, but the writing is going slowly. This is a book that I think will really come together in the revision. And now, as promised, onto Valerie Hobbs‘ answers to your questions. 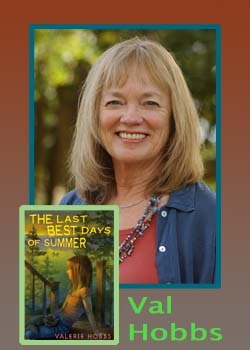 You might remember that Valerie is the author of a bunch of children’s books, most recently the middle-grade coming-of-age novel The Last Best Days of Summer. Two weeks ago, I asked you to give me questions for Valerie, and her favorite one will win a copy of Summer. First, congratulations to Susan Ruch Roush, who won the copy of Valerie’s book. Thanks for the great question, Susan. I’ll email you to get your address. Valerie: It was magical when I let Eddie follow Lucy to the lake. It was what he wanted and he livened up that book so much. Valerie: I don’t see much of an effect yet, but I expect there will be one. Valerie: Great question for which there are many answers. In short, I don’t always know (!) Toby in Defiance just “came to me” out of the blue, but many of my characters (well, all of them really) are me in various guises. They become more and more “real” as themselves as I write. If they don’t, I’m “outa there”! I try to “see” them in my mind (I think I could actually do a better job of that) and I look in a character naming source book for names. Valerie: Hardest thing in the world! I go for a long walk. And pray. Valerie: Absolutely. Although the characters don’t usually start out with the best values, for example, that’s where they end up. So, yes, the characters get the best and the worst of me. Valerie: I just rewrote a book three times that got rejected three times. How’s that? I feel like I’m finished when the end comes together and gives me chills. It takes a while! Valerie: PW just gave the book a starred review which, I think, answers your question. If it doesn’t, write to me and I’ll try to answer it. Valerie: Mostly real events and made up people, although most of them are “me” in various guises. Toby in Defiance was a gift from the gods. Valerie: The title originally was “Lucy In The Sky,” which, I guess, was not good because of the drug connection (!) So then my editor and I went crazy trying to come up with titles. I like this one now. Valerie: I don’t think there is a free one, but there are several who will do this for a fee. I’m sorry, but I don’t know much more than that. You might check with SCBWI.org for more information. Valerie: I didn’t have a best summer memory or a dread to use as a springboard. What I have I guess is a fear of Alzheimer’s disease! Thanks so much, Valerie. And good luck with the book. I think the “piece of the puzzle” that keep The Last Best Days Of Summer from being too quiet is Lucy’s voice and her ongoing worries about her grandmother and about Eddie. Or maybe it’s Eddie himself who refuses to be a quiet character! What do you think?